Let the team at Country Basket Flower Boutique in Niagara design and deliver a beautiful bouquet for you... or someone special to you. We love creating special flower arrangements for the people our customers love! We'll take the time to make sure everything is just perfect for your special someone. 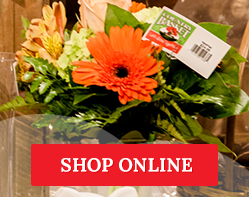 If you'd like to order online, please click on the link on this page and you will be taken to our online flower shop. Place your order and our expert Floral Designers will take care of the details. If you prefer to order by phone, we're waiting to take your call! Your choice! We can deliver your floral arrangement for you, or you can pick it up at our store.